This Datto white paper reviews what makes a hybrid cloud backup unique. 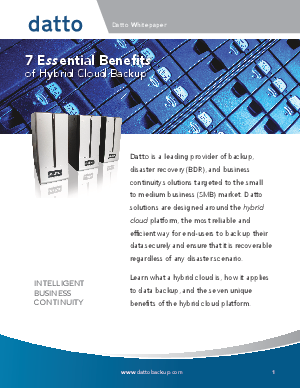 And details seven of hybrid cloud backup’s distinct benefits; including, business continuity, data insurance, local storage flexibility, cost benefits, standards compliance, added revenue streams and infrastructure control. This is a must read to get a better understanding of what hybrid cloud backup is and how you and your clients can benefit from it.